How many times have you heard the words 'keeping it simple', 'less is more' etc etc. If you are an avid Masterchef Australia fan then you know that it's the best advice that the judges like to give the contestant. Respecting the ingredient, it's colour, form. taste, texture, flavour is the key and developing a recipe to celebrate the beauty of seasonal local produce is the mantra of modern day cooking. If you see it closely then you will find this approach is good in so many ways. You not only eat fresh, nutritious food but it also is easy on your pocket. But to achieve such satisfaction you need to start with real good ingredients. Even a piece of toasted bread with a slab of butter could be a very satisfying meal when it's fresh and better if it's homemade. I realised it while we lived in Japan. The veggies there were mostly grown without any pesticide and were processed minimally. The broth based soups with freshly made noodles and braised tofu and veggies were our favourite. Minimum cooking, full of flavour and nutrition. But easier said than done. If you cook regularly then you know perfecting simple recipes with fewer ingredients is the most difficult. but with the onset of winter and the myriad veggies available in the market let's try creating a real simple fresh approach to food. Without relying much on packaged quick cooking meals lets do it from scratch in the minimum time span that we can devote. Soups, broths, salads, one pot meals are great to cook up in short time without reaching for those ready made sauces or ketchups. To help you do this here is one of my very easy soup recipe. It almost cooks itself and is a flavourful guiltfree indulgence after the calorie intake from Diwali. This also is one of the twelve recipes that I shared on a Bengali Television show called Prothoma. Take the chicken and mix with soy sauce. keep aside. Thinly slice the capsicum, carrots. Separate the bok choy. Cut beans in 1" pieces. Bring the stock or the water wih the stock cubes to boil with the chicken pieces. Peel and cut the onion in quarter, peel and roughly chop the ginger, crush the garlic with the flat side of the knife and add to the stock. keep the flame low and let it simmer. To this add roughly chopped lemon grass, celery, mushroom, chopped chilies. Add salt and vinegar as per taste. Cover and simmer for 20-25 minutes or till the chicken is fully cooked. Now add the noodles, carrots, beans. 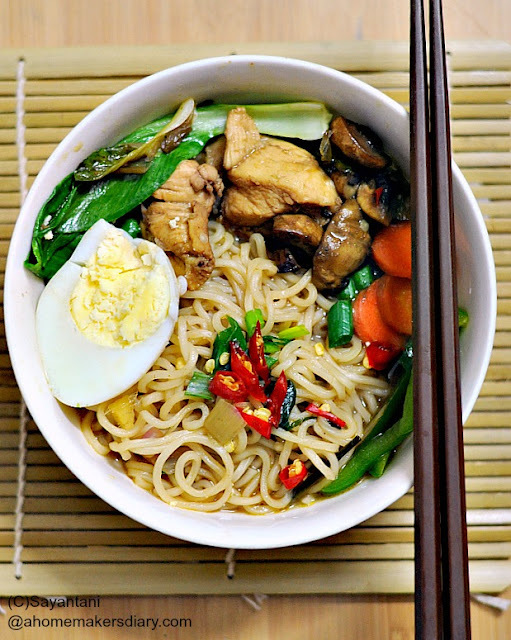 Cook till the noodles is done (2-3 minutes) and then mix in the bok choy and capsicum. Do a taste test and adjust seasoning by adding more salt, soy sauce, vinegar or pepper powder. Serve hot with a boiled egg on top. 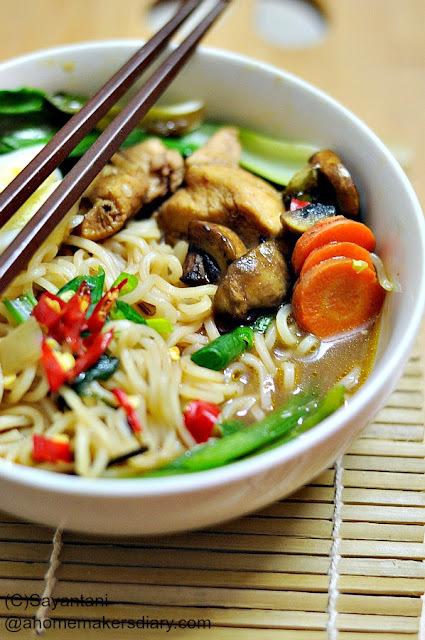 If using button mushroom I prefer to cook it with a pinch of salt and a dash of oil and add it to the broth with the noodles. Yum! Just what a cold-battered soul needs! Noodle soup looks delicious dear.